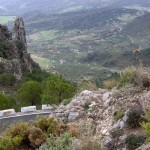 This is a one day tour through the Guadalhorce valley, Sierra de las Nieves, Serranía de Ronda and Sierra de Grazalema, located between Málaga and the province of Cádiz in Spain. 261km of curves through an unique contiuously changing landscape of mountain passes and forests. Do you remember Emilio Scotto? FJ1200, still one of the best?